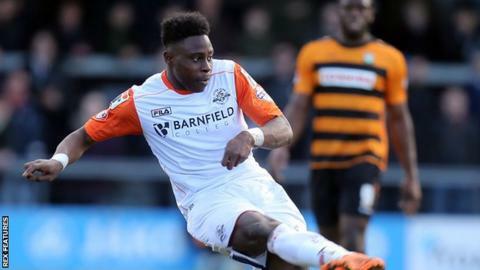 Pelly Ruddock's second goal of the season for Luton all but condemned Dagenham to relegation from League Two. With five matches remaining, the Daggers are 11 points from safety and could go down on Saturday if they lose at play-off hopefuls Leyton Orient. The Hatters took the lead seven minutes before half-time when Ruddock's shot went in off the underside of the bar. Jamie Cureton's shot was cleared off the line and Oliver Hawkins hit the bar as Dagenham failed to find a leveller. Luton picked up their first win in four, but remain six points off the play-off places. Match ends, Luton Town 1, Dagenham and Redbridge 0. Second Half ends, Luton Town 1, Dagenham and Redbridge 0. Attempt missed. Oliver Hawkins (Dagenham and Redbridge) header from the centre of the box is just a bit too high. Attempt missed. Josh McQuoid (Luton Town) right footed shot from outside the box is close, but misses to the right. Corner, Luton Town. Conceded by Ashley Chambers. Attempt missed. Joe Pigott (Luton Town) left footed shot from the centre of the box misses to the left. Corner, Dagenham and Redbridge. Conceded by Alan Sheehan. Attempt blocked. Matthew Cash (Dagenham and Redbridge) right footed shot from the right side of the box is blocked. Foul by Zane Banton (Luton Town). Substitution, Dagenham and Redbridge. Ashley Chambers replaces Matt Richards. Attempt missed. Joe Pigott (Luton Town) right footed shot from outside the box is just a bit too high. Attempt missed. Joe Pigott (Luton Town) left footed shot from the centre of the box is close, but misses to the right. Attempt missed. Joe Pigott (Luton Town) right footed shot from the centre of the box is just a bit too high. Corner, Luton Town. Conceded by Dominic Hyam. Corner, Dagenham and Redbridge. Conceded by Joe Pigott. Corner, Dagenham and Redbridge. Conceded by Glen Rea. Attempt missed. Christian Doidge (Dagenham and Redbridge) header from the centre of the box is just a bit too high. Attempt missed. Jonathan Smith (Luton Town) right footed shot from outside the box is close, but misses to the left. Attempt blocked. Pelly Ruddock (Luton Town) right footed shot from outside the box is blocked.